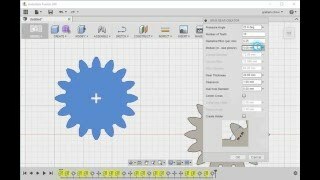 1) You can design a gear that uses a single largest bit to machine. 2) It can create a pocket so you can easily machine the other side of the gear. 3) It uses the undercut to define the fillet. You can also specify an ellipse for the fillet to give an unusual looking gear. Version 1.07, 5/9/2016 Removed the creation of construction plane artifact. Works with "do not capture design history"
Hi Patrick, this is as designed. Maybe in a future release, it can be supported. i needed to make a replacement gear for a RC toy and it was a snap to make with this I am more then happy buying it knowing it works and will be useful when I need it next. OD locked up in the menu. You cannot make a gear of a specified OD outside diameter. The OD is fixed based on the parameters you insert. NOT nice. I'm not able to use this addon because C++ Add-Ins don't work for some reason. If anyone knows a fix please drop a reply. Thank you for creating this add-on, very useful. Having the ability to select a standard profile (GT2, GT3, MXL, etc.) would make this awesome for creating pulleys too. Hi Graham, I love the app, very helpful. Is there a possibility to add an internal gear option....such as the ring gear in a planetary gear set? Thanks! Yes please add the ability to make internal gears! Would it be possible for you to add contact point circle. It would be extremely useful to align the Gears up. it removes the sketches leaving a bunch of yellow extrudes in the time line. I see the issue. I should be able to fix it up in an update. It does use the units that you specify in the browser part of the document - section 5 (http://fusion360.autodesk.com/learning/learning.html?guid=GUID-E647CA56-7187-406A-ACE4-EAC59914FAE4). However you would need to reopen the add in. It does use the units that you specify in the browser part of the document - section 5 &#13;&#10;(http://fusion360.autodesk.com/learning/learning.html?guid=GUID-E647CA56-7187-406A-ACE4-EAC59914FAE4). However you would need to reopen the add in.